Welcome to April 9 MLB DFS action here at DailyRoto. Below you’ll find our Daily Fantasy Baseball Premium podcast for April 9 MLB DFS along with our LIVE Premium Chat and cliff notes. Make sure you’re using our customizable projections tool, you’re actively participating in the live chat, and you’re reviewing the cliff notes to supplement your research and roster construction process. Very best of luck in tonight’s action! Max Scherzer (WAS) projects in a tier of his own, slightly ahead of a second tier shared by Noah Syndergaard (NYM) and Justin Verlander (HOU). All three pitchers project for a similar amount of strikeouts. However, Scherzer projects for outs than Syndergaard and has an IRTA of just 2.9, which is 0.8 lower than Verlander. At first glance, we wouldn’t be surprised if Scherzer’s odds dropped slightly by game time, but he’s the clear number one for us. Whether or not you need to use him in cash games is a different story. While he is a good value in a vacuum, there are a couple of minor concerns – an Atlanta lineup with a bunch of LHBs that has been hitting well and continued cold that may have contributed to shortened starts to begin the year (24 batters faced in each one). On most slates we wouldn’t care, but on a Coors slate where Mike Trout projects monstrously as well, there are viable value pivots off the top-tier pitching. If you’re higher on the Padres bats in Coors Field than our initial projections are, then it might make more sense to pay up for Max in cash games given the affordability of those bats. Syndergaard is in a great spot against a weak Marlins team but duration is a question mark, and the Marlins can be contact-oriented. Verlander offers a discount from Max and Thor on DK, but he still lags behind both slightly from a value perspective. He’s a fine option, but it’s just tough to find room for him in tournaments unless you’re spreading your teams pretty thin or really view him as a plus contrarian option. There are several viable mid-tier values on this slate. Let’s start with the options you’re most likely to consider on both sites, before delving deeper on DK given the two SP setup and pricing structure. The main two are Jon Gray (COL) and Miles Mikolas (STL). Gray may seem like a must avoid at first glance given that he’s pitching at home. Home/road splits are noisy, but just for the sake of showing that you shouldn’t auto-avoid Gray at home, note that he had a .283 wOBA allowed and 3.13 ERA in 46 home innings last season. We won’t pretend that will continue as Coors is a challenging environment, both because of the huge amount of offense it boosts (everyone knows this) and also the reduction in K rate it causes for pitchers. The point is, even when you consider all of this, Gray is simply underpriced against a bad Padres lineup that just got torn up by the Astros RHP and now has no Wil Myers and loses the DH. He’s a -190 favorite with a 4.2 IRTA. Mikolas is in a better environment, at home in St. Louis. However, his skills are much more uncertain. He was terrible in his pro career in the States before going over to Korea and performing well enough that Steamer projects him for a low 4s ERA with 8.54 K/9. Most projections systems are a bit lower than that, but Mikolas was solid in the Opener in this same matchup. The only issue was the long ball (and possibly hanging around too long), but the park shift goes in Mikolas’ favor this time around, and there will be no Christian Yelich. Mikolas doesn’t have the upside Gray does, but he feels like a pretty safe option at an incredibly cheap price tag on FD, which really lets you stack up your offense. Over on DK, there’s one value that surpasses both Gray and Mikolas – Garrett Richards (LAA). We’ve been on Richards in each of his first two starts, with mixed results, but the bottom line is he remains way too cheap. He gets a big negative park shift pitching in Texas against a Rangers team that leads MLB in Hard%, but that’s somewhat mitigated by cooler temperatures. More importantly, Richards projects as a sub-4 ERA pitcher with nearly a strikeout an inning ability. We’ve noted that projections systems favor his future K rate more than his past K rate, and early on Richards has shown why, with a 14.1 SwStr rate and average fastball velocity of 96.4 mph. One other name that belongs in here who we have projected slightly ahead of the three names above but comes at a heftier cost is Dylan Bundy (BAL). Bundy is an excellent tournament option, and there are routes to using him in cash games if you really believe the early season results. On the surface those results have been great (0.69 ERA, 15 Ks and 0 BBs), and they are backed up peripherally. Bundy is throwing his slider a little bit more, and he’s generated an awesome 16.7 SwStr rate and 39.2 chase rate. The schedule has been soft, but it remains soft, at least from a strikeout perspective. The Jays currently have a 26.8 K% against RHP. Cody Reed (CIN) is a punt option on DK. He got smoked in his opening start and then pitched in relief (second start was skipped). There’s a lot of downside and duration concerns on the upside half of the equation, but still Reed is priced as a full punt ($4,700) and should possess around a league average K rate. JA Happ (TOR) is tournament viable on both sites. The Orioles have been very K heavy early in the season, and Happ has a 31.8 K% through two starts, backed up by a 13.8 SwStr rate. A slate that holds both top arms and Coors Field will have us looking to save as much room as possible at catcher – pushing Tucker Barnhart (CIN) and Robinson Chirinos (TEX) to the top of the value rankings on DraftKings. Barnhart has been all over the place in the Reds lineup, but most recently hit sixth versus Jameson Taillon in Pittsburgh. We’re projecting him back in that spot against a much less talented arm in Ben Lively in Philadelphia. Not known for his offense, at least we’ll be getting Barnhart from the left side of the plate where he’s been considerably better in his career. Chirinos gets a tough matchup with right-hander Garrett Richards, but he actually has a semblance of upside given his .232 ISO against RHP since 2015. Chirinos has seemingly cemented himself in the 6th spot of the order as well, giving us plenty of reason to be “optimistic” on his $2,800 price tag. Chris Iannetta (COL) gets the Coors Field boost and will grab the platoon edge on left-hander Clayton Richard. Since 2015, he’s posted a .179 ISO against LHP. Unfortunately, he has many more compelling teammates, forcing his $4,000 price tag to be a tournament exposure only. Austin Hedges (SD) is on the opposite side of the Coors game and is being noted for simply that reason. The matchup with Jon Gray is not something we’re looking to exploit, but taking advantage of a great park for only $3,200 is acceptable. Joey Votto (CIN) is the clear top value at the first base position. And even on a slate with Max Scherzer, Noah Syndergaard and Coors Field, he’s a viable fit in cash games and tournaments. Votto is the perfect mix of all things offense, posting a .422 wOBA, .241 ISO, and a -2.9% difference in K-BB to RHP. Opposing right-hander Ben Lively posted an xFIP over 5.5 last season and struggles to put the ball on the ground. Unleash Votto, especially at $4,200 on DraftKings. Brandon Belt (SF) rates well on both sites, largely on account of his absurdly cheap price tag. While the matchup nor park are very appealing, it’s the price tag ($3,000 on DK, $2,700 on FD) that thrusts him into the conversation. As you start to be a bit more site specific, Matt Carpenter (STL) stands out on DraftKings and Joey Gallo (TEX) does on FanDuel. Carpenter’s appeal is largely a cheap price tag ($3,300 on DK) and a matchup with RHP Jhoulys Chacin. Matty has posted a .389 wOBA and .248 ISO against RHP since 2015. There isn’t much need to harp on Gallo’s skill set any longer. He has massive power and will get the platoon edge on Garrett Richards. He doesn’t even appear as near valuable on DraftKings, but at $3,200 on FanDuel is more than a tournament conversation piece. Paul Goldschmidt (ARI) will take on a big negative park shift, but gets the soft-tossing left-hander Derek Holland. Goldy joins the club with impressive platoon edge numbers with a .425 wOBA and .247 ISO against LHP since 2015. He’s an excellent tournament pivot where the price tag keeps him as a difficult spend for cash. Ian Desmond (COL) is 1B eligible on FanDuel where he’s the fourth best value at $3,900. Unfortunately unlike some of his right-handed teammates, he hasn’t been that dynamic against southpaws (.158 ISO since 2015). D.J. LeMahieu (COL) is the top projected scorer at the position, but it’s likely you’ll want to spend on some of his other teammates. The tough part about DJ is that he gets priced up alongside his Coors compadres (see what we did there) but he lacks the upside to make you feel comfortable with his price tag (14 total HR/SB last season). He should absolutely be included in Coors/Rockies stacks, but we’re looking elsewhere in cash. Elsewhere is down the pricing spectrum. Whit Merrifield (KC) and Scooter Gennett (CIN) are the most eyed values on both sites. Merrifield is one of those under the radar event type players, posting a .180 ISO against LHP and 53 total SB/HR last season (yes, that’s correct). His opponent, left-hander Marco Gonzales has really struggled with RHB (albeit a small sample size) allowing a .418 wOBA and .224 ISO to RHB in his young career. At $3,100 and $3,300 on FanDuel and DraftKings respectively, he’s the top value on both sites. Scooter has an exciting opportunity against Ben Lively as well. He comes in a prime lineup spot and is actually a bit cheaper than Merrifield on both sites. Especially on FanDuel where he’s $2,800 – he’s a candidate for cash games. He’s shown some flashes of power (most notably the four homer game last year) and has posted a .173 ISO against RHP since 2015. Devon Travis (TOR) would be a top value if he should find his way back to the leadoff spot against Dylan Bundy. The same goes for Carlos Asuaje (SD) who has found himself all over the order for the Padres. He hit leadoff against Charlie Morton yesterday, and will pop a bit more if he happens to find himself there again. Nolan Arenado (COL) is the crown jewel at the third base position on Monday. Little needs to be said about his skills against LHP, but we want to say it anyway. He’s posted a .394 wOBA and .271 ISO against southpaws since 2015. The price tag is responsibly juiced but he’s a cash game fit on both sites with the potential to find value at SP and some secondary positions. Kyle Seager (SEA) is the much cheaper value at the position. The context is nowhere near as good for Seager, but he will grab the platoon edge on Jakob Junis. Junis wasn’t really that bad last season, but he doesn’t project to be overpowering. The lesser of the Seager brothers, Kyle has still posted a .195 ISO against RHP since 2015. The $3,200 and $2,900 tag on FanDuel and DraftKings respectively represent a big price drop from Arenado – but one that will still be tough to embrace. There is a huge value drop after the first two names. Mike Moustakas (KC) is actually the third best value on FanDuel, but he’ll be left-on-left in Seattle. Luis Valbuena (LAA) rates decently on both sites and he’s surprisingly powerful against RHP (.240 ISO since 2015). He’ll also get a park shift in his favor as he moves to Texas to face Doug Fister. Manny Machado (BAL) and Josh Donaldson (TOR) would be the higher upside tournament pivots away from Nolan Arenado if choosing to do so in tournaments. A pair of Rockies are the top values at shortstop. Pat Valaika (COL) and Trevor Story (COL) are two completely different players, but also two different price tags. Valaika has found himself in the seventh spot in the order against left-handers and rightfully so given his small sample size power streak against southpaws (.369 wOBA, .265 ISO). Story is the true upside play here, but Valaika will allow you be a lot more flexible in lineup construction. Story has been excellent against LHP, but the most exciting part of this matchup is the opposing arm’s inability to strike hitters out. Story’s kryptonite is the strikeout but Clayton Richard has a career 14% K%. Ketel Marte (ARI) and Jean Segura (SEA) would be the non-Rockie shortstop options that largely fill the same need – a cheap bat with a decent lineup spot. Both are $3,500 on DraftKings, but on FanDuel Marte is just $2,500, a much cheaper option to choose from. Cheapies emerge as the top values in the outfield on Monday, outside of Mike Trout (LAA) that is. Trout is the clear top value at the outfield position as he’ll get a big park shift in his favor and a matchup with Doug Fister. Given the values behind him and at other positions, you can make a Trout/Arenado/top arm lineup work, even in cash games. Manuel Margot (SD) and Michael Conforto (NYM) are the top two values on both sites. We’re expecting Margot to get back in the leadoff spot in Coors Field, reason alone to consider his services at $2,200 on FanDuel. Don’t forget though, he’s a 30 HR/SB type player. At $3,900 on DraftKings, he floats just outside the top ten values. Conforto is an awesome value on both sites given his ability against RHP (and Jose Urena‘s struggles with LHB). Conforto has posted a .263 ISO and .382 wOBA against RHP and at just $4,000 on DraftKings he’s particularly enticing. At $3,800 on FanDuel he still rates as an excellent value, but more of a difficult play for cash games. Jesse Winker (CIN) remains a top value on both sites as his skills against RHP have proven worthy. He’s only $2,800 on FanDuel and $3,000 on DraftKings and will get a much better park in Philadelphia than he just had in Pittsburgh. In just over 100 big league at-bats against RHP, he’s posted a .269 ISO. His teammate Scott Schebler (CIN) fits the same mold. Schebler has a much bigger sample size though, posting a .221 ISO in over a season’s worth of at-bats against RHP since 2015. Dexter Fowler (STL) and Kole Calhoun (LAA) are the final two mid-tier values that can help free up some cap space for Coors. Both guys will come with good lineup spots and the platoon edge (in the case of Fowler we’ll get him from the left side). The price tags are similar enough that you might end up simply siding with the better park and Calhoun if deciding between the two. The aforementioned values open up the ability to reach Charlie Blackmon (COL), Carlos Gonzalez (COL), and Ian Desmond (COL) (OF eligible on DK) despite them not rating well from a value standpoint. The Rockies are the top stack on the night and have an implied run total of 5.8 runs. In the case of Blackmon and Cargo, it’s an interesting night to force their action in tournaments where more people might look the other way given the left on left matchup. The Rockies are the obvious top stack and it’s possible to get bits of them in cash games throughout the lineup. In tournaments the play or fade question is always difficult, especially on a slate that has top tier pitching in it. If we had to choose, we’d side with the Colorado side of things since we’re fond of the mid-tier pitching. 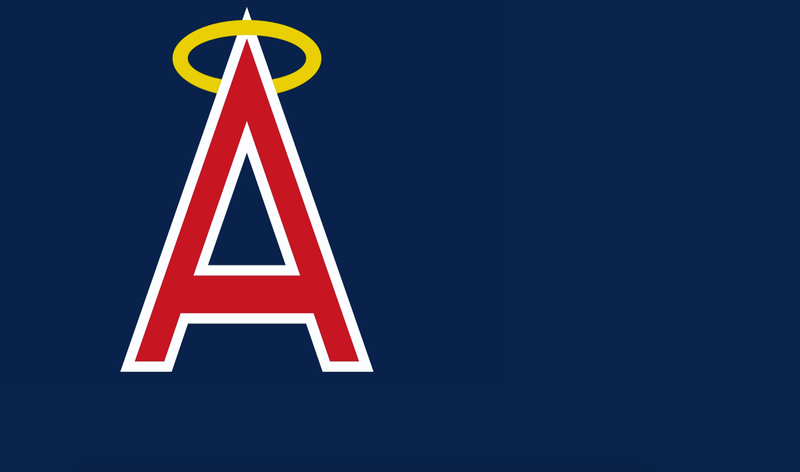 The Angels are currently fourth in MLB in Hard% and take their act to hitter friendly Texas, a large positive park shift. Doug Fister throws 88 and is not fooling anyone, putting up just a 19.4 chase rate to begin the year. The Reds are the best value stack, coming in at a substantially lower average cost than the other top four stacks. As we’ve often mentioned, we enjoy picking on Ben Lively because he allows a lot of balls in play (low K and BB rates) and the majority of those balls are hard hit aerial contact. The Nationals are a great contrarian stack, likely priced too high to be considered a value stack and likely carrying less ownership than the top two tier stacks. Julio Teheran has been brutal to start the season. While you could chalk it up to early year rust and/or cold weather, Teheran has seen his fastball velocity dip to 89.2 mph (91.4 last season). As a result, his K%, which dropped last year too, is at just 12.8% and he’s allowed a 44.4 Hard%. The Padres are in an interesting spot. They’re pretty affordable for a Coors Field stack, and it’s a particularly big park shift for them. At the same time, being in Coors likely auto bumps the ownership, and they have just a 4.2 IRT against Gray. The median outcome for San Diego is likely less than the market thinks, however any game in Coors can get nutty if it gets into the bullpen early. The Diamondbacks are one of our favorite stacks from this tier as Pollock and Goldschmidt provide significant upside against LHP, especially one as week as Holland (ZiPS projected 5.01 ERA). Then you’ve got a likely underowned Peralta in a L/L matchup and a cheap infield between Marte and Ahmed.